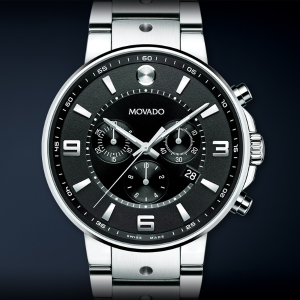 JomaShop.com offers the lowest price Movado Men's SE Pilot Watch 0606759 for $475 via coupon code DMOONFS20 . Features: Stainless steel case with a stainless steel bracelet. The Movado dot apperas at the 12 o'clock position. Date display at the 4 o'clock position. Chronograph - three sub-dials displaying: 60 second, 30 minute and 1/10th of a second. Swiss quartz movement. Scratch resistant sapphire crystal.Case diameter: 42 mm. Water resistant at 30 meters / 100 feet.